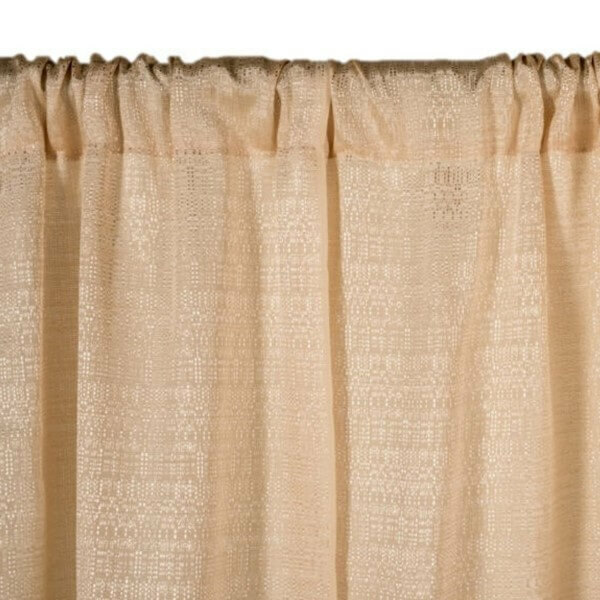 Banjo drapes have a long history as the standard for convention centers, trade shows, job fairs, and other expos due to its inexpensive price and inherently flame retardant nature. This medium weight fabric has a semi-sheen and features an irregular thread pattern throughout. There is a brighter sheen -- almost a "sparkle" -- at the portions where the threads are the thickest. Our Banjo drape is Inherently Flame Retardant (IFR) and passes the NFPA 701 fire code. Each drape measures 70 inches tall x 48 inches wide, and has a useable ribbon selvedge on each outside edge. The drape is sewn 2 inches shorter than 6 feet tall to avoid pooling on the floor when used at a 6 foot height. Custom heights are available upon request. Drape is not pre-pleated; it is sewn flat and can be gathered by hand on a support rod (crossbar). 4 inch rod pocket is sewn into the top and bottom. 100% Polyester. Machine washable and dryer safe - see Laundering tab for details. Quantity 1 = 1 drape. We recommend a minimum of four drapes per 10 foot wide span (for approx. 60% fullness). Approximately 50% - 60% opaque (light blocking). This opacity percentage is an estimate only, and for normal / standard lighting situations. A variety of factors can affect the opacity of a fabric, including where it is being used (near a wall vs. dividing the middle of a room), light sources (such as hanging in front of a window with sunlight shining in, etc. ), and the amount of fullness in the material (the amount of "bunching").